First, this "High-Low Triangle Offense" is not the same as the "triangle offense", originated by Sam Barry and refined by Tex Winter and Phil Jackson, although this offense does incorporate some of those concepts. This article discusses basketball's "High-Low Triangle Offense" and coach Lason Perkins' excellent DVD. Coach Perkins at this writing resides in Cary, NC and coaches basketball at Cary Academy. Lason Perkins is recognized globally as one of basketball's brightest coaching minds. He has coached at every level of basketball from elementary school to the professional ranks, and is the creator of many instructional basketball videos. He is a great student of the game with an expert understanding of Xs and Os, and maintains contact with coaches from around the world. I always enjoy watching Coach Perkins' DVDs because he explains and demonstates things so well, and everything seems obvious, simple and easy to understand. 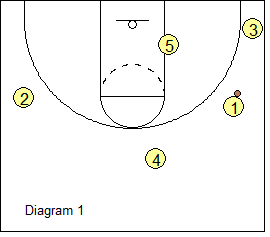 Coach Perkins' High-Low Triangle offense is a combination of man-to-man and zone offenses, and incorporates some elements of Tex Winter's triangle offense. 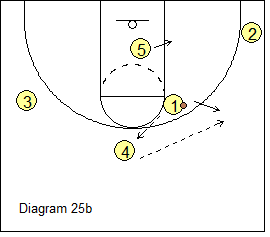 It can be used against both man-to-man and zone defenses. It is a patterned offense with continuity, but has many options and entries. See diagram 1. 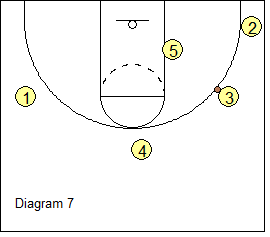 This is the basic alignment for both man-to-man and zone offenses. This is very similar to that used in Winter's triangle offense. We see the two basic triangles that we like to create in diagram 2. This offense uses ball reversal, screens and aggressive cutting, and all five players are involved with good opportunities for post moves and outside 3-point shots. Wing players - always look first to feed the low post, and also look to score, pass to the corner, or pass back to the top for a hi-lo pass, or skip pass to the opposite wing. Corner players - look to pass into the low post (and post cut), or shoot or drive to the hoop. Low post players - look to score, and are aggressive posting and sealing defenders inside and demand the ball. Top player - looks to pass hi-lo inside to the post player, or may shoot the 3-pointer, and is key in reversing the ball to the opposite side. 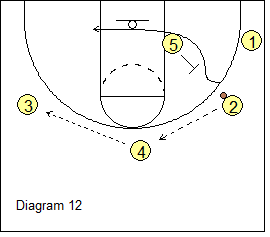 O1 dribbles to the right wing (diagram 3) to start the offense. 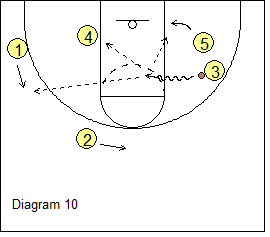 If the pass to O5 is not open, O1 reverses the ball back to O4 on top. 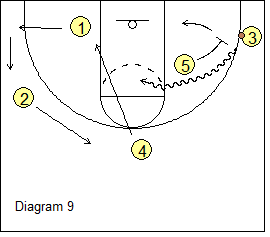 If the hi-lo pass to O5 inside is not open, O4 then passes to O2 on the left wing, as O5 then back-screens for O1. O1 cuts either over or under the screen to the opposite (ball-side) block for a possible quick pass from O2 for a lay-up. If not open, O1 goes to the left corner. 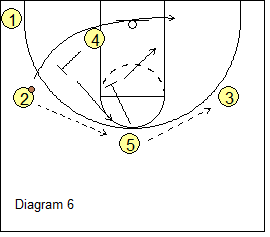 After passing to O2, O4 down-screens for O5 (diagram 4), and O5 cuts to the top spot. After screening, O4 cuts to the ball-side low block and posts-up for a possible pass inside from O2. O3 rotates up to the right wing. Diagram 5 shows the continuity and now we are in our original triangle setup, only on the left side. To further show the continuity from side to side, diagram 6 shows ball reversal again with O2 passing to O5. O5 looks inside to O4, not open, and passes to O3 on right wing. O4 back-screens for O2 and O2 cuts to the ball-side low block, and out to the right corner if the quick pass from O3 is not open. O5 down-screens for O4, and O4 cuts to fill the top spot. After screening, O5 goes to the right block and aggressively posts-up. Diagram 7 shows we are back in our original triangle set, but with O1, O2, and O3 exchanging spots. Diagram 8 shows O1 passing to O3 in the corner. 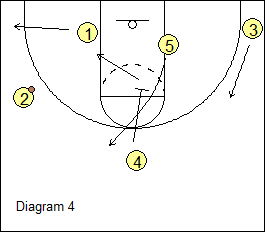 O5 back-screens for O1 and O1 cuts through, looking the pass from O3 and a lay-up. If O1 does not get the pass, he/she goes to the weak-side (left) corner. 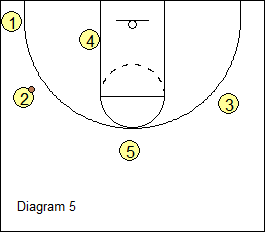 After O1 cuts, O5 ball-screens for O3 (diagram 9), and O3 and O5 run the pick-and-roll play. As this is happening, O4 cuts to the left low block, O2 rotates to the top spot and O1 moves up to the left wing spot. Diagram 10 shows options off the pick and roll... O3 looks to score, or pass to O5 on the roll cut, or to O4 on the opposite block, or a kick-out pass to O1 for an open 3-point shot. This simple option comes from Rick Majerus when he was at Utah. O1 passes to O4 and cuts inside (diagram 11). On this cut, O1 "bumps" the X5 defender, momentarily freeing O5 up for a quick hi-lo pass from O4, and an inside basket. After the "bump", O1 goes to the left corner. 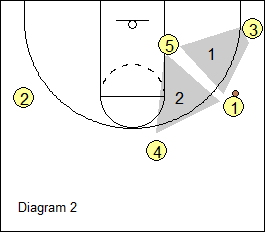 This is a great option to use if the X5 defender is either in foul trouble, or mis-matched vs our O5. Use this option if you have a tall guard with post-up skills and a mis-match with his defender. Diagram 12 shows O2 passing to O4 on the top. 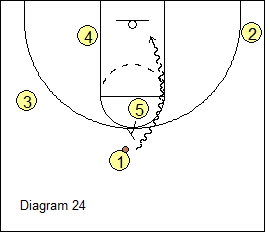 O4 reverses the ball to O3 (left wing). 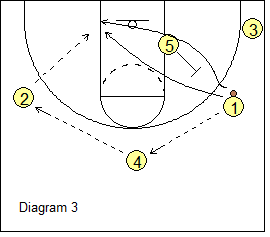 Meanwhile, O5 makes the usual wing back-screen for O2, and O2 cuts to the ball-side (left) block and posts-up for the pass inside from O3 (diagram 13). After screening for O2, O5 simply pops out to fill the right wing spot. This is really just an extension of the "Guard Hold" option. If O2 does not get the pass inside, he/she then moves up and back-screens for O4. 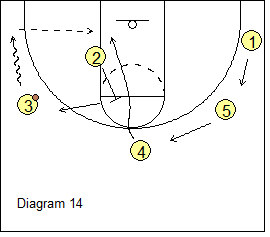 O4 then cuts to the ball-side block to post up. O3 takes a few dribbles toward the corner for a better passing angle to O4. After screening, O2 moves to the left wing, O5 goes to the top spot, and O1 rotates up to the wing. Diagram 15 shows we are now in our familiar triangle set (left side). Diagram 16 shows O2 starting the continuity action with a pass to O5 on top. O4 back-screens (as usual) for O2, and O2 cuts through, and O5 passes to O3 on the left wing... everything as in our normal action so far. Now, instead of O5 down-screening, O4 back-screens for O5. 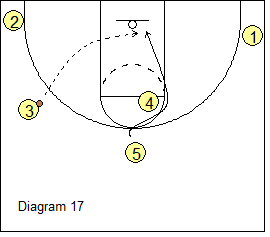 O5 cuts hard around the screen to the hoop for a possible lob pass and dunk (diagram 17). From our triangle set, O1 passes to O4 (diagram 18), and cuts around O5's back-screen to the opposite corner. Instead of O4 passing to the left wing, he/she dribbles toward O2 and makes a dribble hand-off to O2. 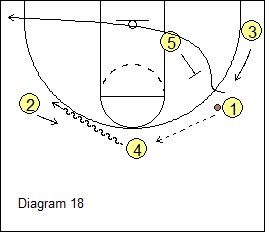 O2 dribbles to the top (diagram 19) and could shoot if open, but also looks to pass hi-lo to O5 posting up inside. 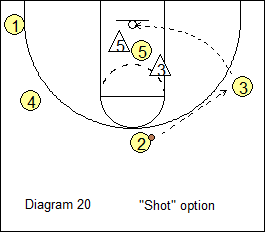 If the X3 defender is helping inside to deny this pass (diagram 20), O2 passes over to O3 for the open 3-point shot. 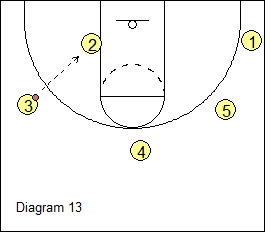 From our triangle set, O1 passes to O4 (diagram 21), and cuts around O5's back-screen to the opposite corner. O4 passes to O2, and O2 passes to O1 in the corner. 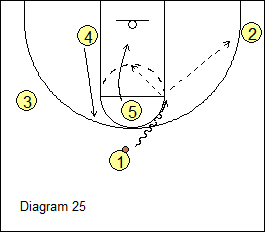 O2 and O4 then set a double ball-screen for O1. 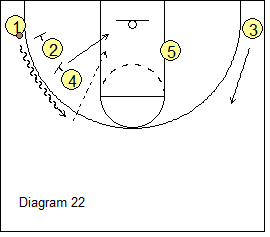 O1 dribbles around the screens (diagram 22). O4 rolls inside and could get the pass from O1. 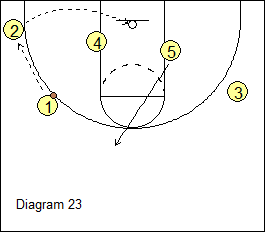 After screening, O2 pops out to the corner and could get the pass back from O1 (diagram 23), for an open 3-point corner shot (shot option). Notice that O5 moves to the top spot and O3 fills the right wing. You can start the offense with a high ball-screen for O1 (the "Up" series). There are three options here: "up-rack", "up-roll", and "up-corner". Diagram 24 shows O5 setting the ball-screen for O1, and the "up-rack" option where the X1 defender gets caught on the screen and O1 goes to the hoop for the lay-up. 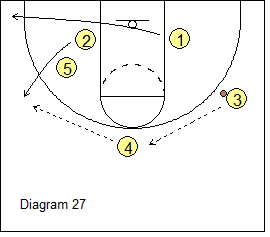 If the defense hedges the ball-screen (diagram 25), O5 rolls to the hoop for the pass from O1 ("up-roll" option). 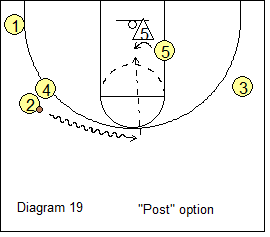 If the pass to O5 is not open (X2 down in helpside), O1 could kick-out pass to our shooter O2 in the corner for an open 3-point shot ("up-corner" option). Notice that if O1 cannot get to the rack option, he/she could pass to O4 and O1 fills the right wing spot. O5 goes to the right block. O4 passes back to O1 and we are in our triangle set (diagram 25b). Optionally, if O1 gets "stretched out" on the ball-screen, instead of passing to O4, he/she could just dribble to the right wing and establish the triangle that way. From here, we run the continuity pattern. 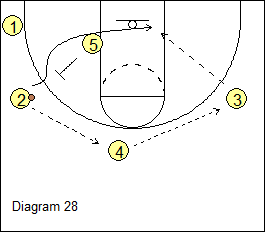 Here we start the offense with a 2-3 set (diagram 26). O2 passes to O3. O2 and O1 "split" cut around O4, with the passer cutting first. 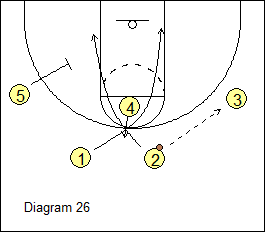 O3 might be able to pass to an open cutter here. If not, O4 pops out on top and gets the pass from O3 (diagram 27). O5 down-screens for O2, and O2 cuts out to the left wing and gets the pass from O4. O1 goes to the left corner, and O5 posts-up. We are now in the triangle set on the left side (diagram 28). From here, if the pass into the post is not open, we run the pattern. O2 passes to O4, and O4 passes to O3. O5 back-screens for O2, and O2 cuts through. O4 would then down-screen for O5, who goes to the top, and O4 posts up on the right block. 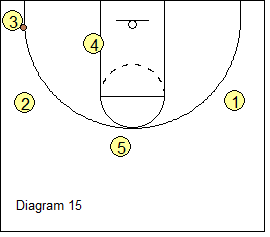 Get the rest of the High Low Triangle Offense details in Coach Perkins' High Low Triangle Offense DVD, the Premium Members section and the Playbook download. In summary, as you can see, the High-Low Triangle offense is useful in attacking both man-to-man and zone defenses, and affords many options and entries.